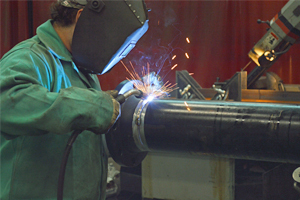 Danforth offers Pipe Fabrication in New York State. Our skilled work force consisting of Union Craftsmen and experienced and dedicated management staff is capable of completing any piping project. Our day-to-day work activities include Plumbing, HVAC, Process and Industrial Piping System Installation and Repairs. We successfully complete work on both common and unique installations requiring everything from good piping practices to ASME Code required piping installations and repairs. We understand the importance of a quality installation for years of trouble free use. We begin our installations with the thought of turnover, service, and end use at the forefront of our jobs. We pride ourselves on doing it right the first time. This quality installation and commissioning process ensures owners and end users will have a comfortable environment and reduced maintenance costs for years to come. Our state of the art Pipe Fabrication facility uses the newest technology and equipment for fabricating piping systems. Combining this with our professional management team and skilled tradesmen is a recipe for a successful project. We are able to meet the accelerated schedules in today’s market with proper planning, fabrication and quality installations in the field. Our goal is to lead the project and exceed the owner’s expectations with a safe and successful project environment and final product. Start Your Pipe Fabrication Project with Danforth. Meet with one of our Pipe Fabrication consultants. We’ll outline our process and begin your project estimate. Need More information? Send us a quick message and we’ll reach out to you to help plan your next Pipe Fabrication project. Get answers about our Pipe Fabrication services and speak with a knowledgeable Pipe Fabrication Expert.